In the last post we discussed Bonhoeffer's understanding of the "world come of age," specifically how the world come of age acts as a midwife to the gospel. In the world come of age we no longer look for God "out there" beyond the blue. The forces of secularism push God out of the world. Generally speaking, Christians have seen this development as a bad thing. But Bonhoeffer sees this as a good thing. We no longer look for God "out there" in a world come of age, so we are forced back into the daily affairs of this world. This is a positive development, because, according to Bonhoeffer, the God revealed in the gospels was never found "out there." Rather, God is always found in our midst, or suffering on the cross. Thus, we shouldn't be worried, as a church, that God is now overlooked in our world. Because that's how we find God treated in the gospels: Overlooked. In short, the God pushed out of the world is actually a "false God," a vision of God that occluded the God found in the gospels: the Crucified God. Thus, before God we live etsi deus non daretur, as if there were no "God." The missional objective in all this is to prevent other-worldliness, to force the church to find God in the world. In this post I want to turn to Bonhoeffer's analysis of religion, particularly his discussions of a "religionless Christianity." What we'll discover in this analysis is a set of ideas very similar to the ones we encountered with the "world come of age." What does it mean to "interpret in a religious sense"? I think it means to speak on the one hand metaphysically, and on the other hand individualistically. Neither of these is relevant to the biblical message or to the man of today. Hasn't the individualistic question about personal salvation almost completely left us all? Aren't we really under the impression that there are more important things than that question (perhaps not more important than the matter itself, but more important than the question!)? I know it sounds pretty monstrous to say that. But, fundamentally, isn't this in fact biblical? Does the question about saving one's soul appear in the Old Testament at all? This is the same dynamic we saw in the last post. 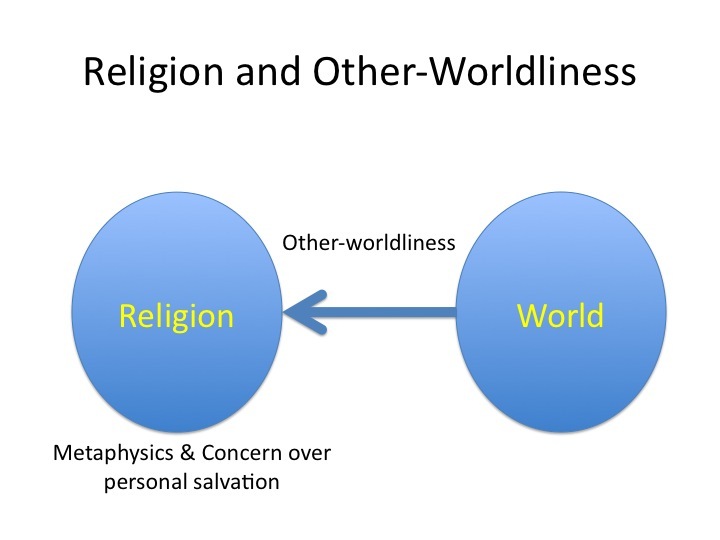 Only now we are focusing on how religion becomes a vehicle of other-worldliness. So what is the solution? 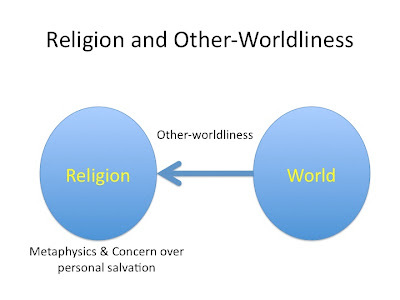 Well, what we need is an interpretation of faith that is "nonreligious," an interpretation of faith that creates a this-worldliness. This is what Bonhoeffer is trying to achieve with his vision of a "religionless Christianity," a faith that moves Christians deeper into the world. 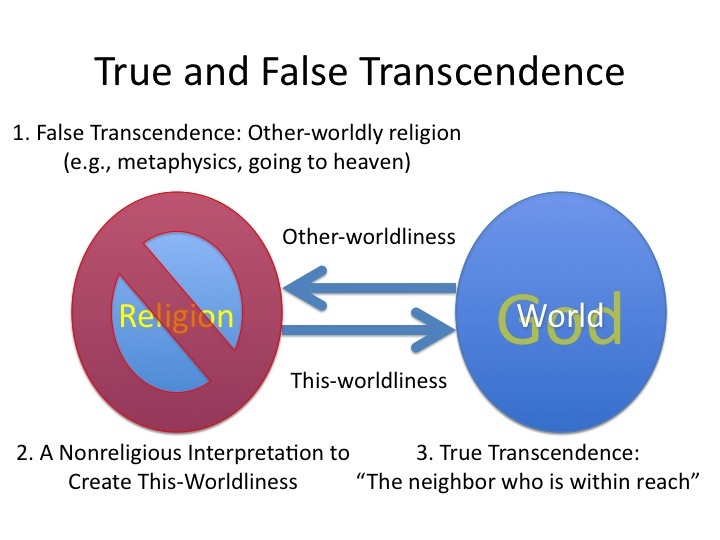 I'm thinking about how we can reinterpret in a "worldly" sense--in the sense of the Old Testament and of John 1.14--the concepts of repentance, faith, justification, rebirth, and sanctification. We got a hint above about Bonhoeffer's interest in using the Old Testament as a guide for his nonreligious interpretation. 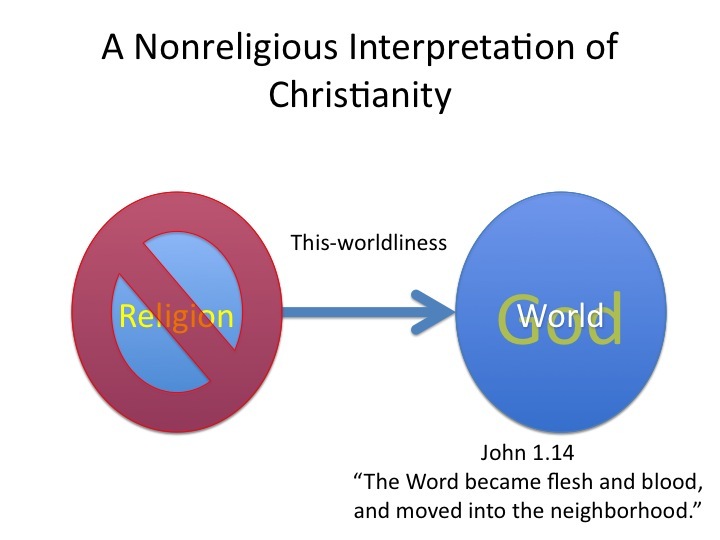 As he notes, there is very little other-worldliness in the Old Testament. When the Psalms speak of salvation they are asking for salvation now. In this world. In a similar way, when the Psalms cry out for justice they are asking for justice now. In this world. God's interests are totally absorbed with this world, right now. Salvation and justice are about what happens today. But it's not just the Old Testament. The Lord's Prayer captures it well: "Thy kingdom come, thy will be done, on earth as it is in heaven." But the trump card is the Incarnation itself. Bonhoeffer cites John 1.14. How this-worldly can you get? For me, this conclusion is stunning. To find God I don't leave this world to search Somewhere Beyond the Blue. I don't find God in my heart (individualism) or in heaven (metaphysics). Although religion, on a daily basis, tempts me in these directions. Rather, I look for the "neighbor who is within reach." And in "being there for others" I encounter Christ. This is a true, this-worldly, Old Testament, Incarnational, John 1.14 transcendence. A nonreligious Christianity. The Word is flesh and blood and lives in my neighborhood. 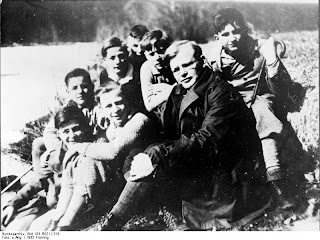 And, to conclude, in that phrase, "Jesus is there only for others," we get very, very close to the answer to the question that has been haunting Bonhoeffer's letters: Who is Christ for us today? I'm loving this series, professor Beck, partly I think because this is the direction my own thought and writing has been moving. I've read some Bonhoeffer before, but not this work. The most frustrating thing for me, in this regard, is the willingness on the part of so many to except the basic premise, while simultaneously being unwilling to take it quite far enough. 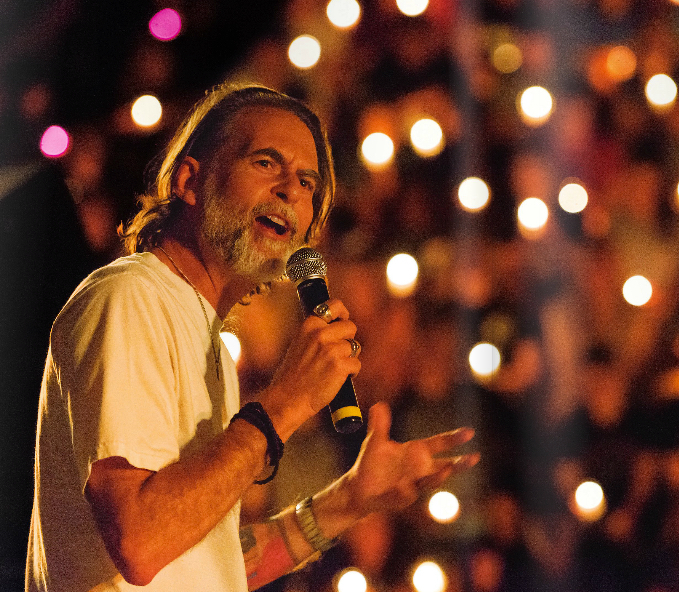 Toss out the religion completely, I say, and start loving Jesus! By which I meant to say, "accept" the basic premise. Doh! I have a concern, and I fear that the answer is going to be that "Bonhoeffer did not live to work that out." My concern is that for being "there only for others" can only be meaningful when the further question is answered: Which others? 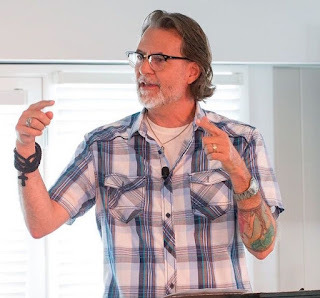 When "Jesus wept" it was because he had had to make a personally painful choice about whether to "be there" for a dying friend or to conduct a ministry imperative. The ministry imperative won, presumably because being true to his life's work took precedence over "being there" for his friend. This is not an unusual dilemma for any of us in the sense of there being tension between our life's work and our personal commitments. My "fear" is that in addressing these tensions that we will have to smuggle in a framework for deciding what choice to make, in which case we are acting on a rationale beyond "being there." And it seems that Jesus was doing just that. The same kind of point could be made about HOW a Christian should "be there" for others. There are good/bad and appropriate/inappropriate ways of being there. No sensitive person likes to disappoint others, but that sensitivity (combined with a large dose of narcissism) contributed to President Clinton's infidelities. But i would love to be surprised. Very interesting post. There was a period of my life when I was around a lot of people who had a big emphasis on being "God centered". As time went on though I started feeling uneasy about the whole idea. It seemed like the more "God centered" things became the more it started to feel self-centered. I don't know if I have a handle on it yet but the relationship between loving God and loving your neighbor is kind of mysterious. Typically, we believe that God's core concern is obedience on our part. I question this belief. Having worked in terms of design and engineering, I would argue that if one's core concern is obedience, then one shouldn't "design and engineer" something with a will separate from their own will. And yet God violates this basic engineering sensibility: not only does He create a separate will, She does so by the billions as you and I each show up with selfs/wills that are distinct and- unique: Even though we are all made of the same materials, there's something unique to you, constantly working at organizing all the stuff of human life into you--and me into me. How can that happen? How does God accomplish such a feat of "engineering"? In light of such a feat, where billions of wills show up--all of whom are unique--I would offer that either, 1. God is stupid; or 2. God's core concern is centered on something else other than obedience. What then, is this something else? I think Richard's post's here are getting at that answer.